London 2012 chairman Lord Coe has promised a "safe and secure Games" despite the security guards debacle. "We have got the numbers, courtesy of the military and our police services," he told BBC Radio 4's Today programme. An extra 3,500 troops were drafted in last week after security firm G4S admitted a shortage of staff, and a further 1,200 troops are on standby. Arriving at Heathrow, International Olympic Committee head Jacques Rogge has said he is "confident" on security. The head of security and counter-terrorism at the Home Office, Charles Farr, has told the BBC that plugging the G4S gap with military personnel meant that in some respects there was an even stronger workforce now involved in the security operation. From government head honchos to children in their ponchos, they've all been here in the Olympic Park on Friday. Home Secretary Theresa May and Metropolitan Police Commissioner Bernard Hogan-Howe toured the control room, from where the massive security operation will be directed, oozing reassurance. The children in their ponchos, trying to keep dry from the still unwelcome rain, were heading towards the main stadium to take part in rehearsals for the opening ceremony in seven days' time. More flags are going up in the Olympic Village to mark the arrival of each new delegation of athletes. You see people jogging - nothing unusual about that, until you notice the speed and grace with which they're moving. There is still the sound of drilling and banging; there are still plenty of people in fluorescent jackets and hard hats. But this is not a lack of readiness. The Olympic cake is baked. What everyone is doing now is just putting the icing on it. Offering a similar view, Met police Commissioner Bernard Hogan-Howe said: "It's not a bad solution to have about 11,000 fully-trained soldiers under a military command from one of the best armies in the world." 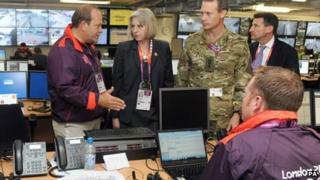 The 11,000 troops helping secure Games venues are among 17,000 military personnel involved in Olympics security overall. Lord Coe said: "This is not an issue that has remotely compromised security. This was actually about the supply and the mix, it's never been about the numbers. "We have got the numbers, courtesy of the military and our police services, we have got the numbers to make sure that this is a safe and secure Games." Mr Rogge said: "The government compensated for the shortfall that was possibly going to happen, so we feel very reassured for that, and I have got all assurances from the government that security will be in place." He added: "I am not concerned, I am confident in the flexibility and the capacity of the organising committee and the public authorities." On Thursday, G4S released a statement saying it was making "good progress" and there were daily increases in the number of people working at Olympic venues who had completed training and accreditation. The opening ceremony for London 2012 is now just a week away, and will take place at 21:00 BST (20:00 GMT) on Friday 27 July. Speaking to the BBC, Lord Coe stressed the scale of the task of hosting an Olympics, saying it effectively involved staging "in 19 days, in this city, 26 simultaneous world championships". "No city is challenged in the way a city is challenged when it delivers an Olympic Games." But he added: "I'm talking to people who think they have come to a Games that has delivered in the areas that they need in a way that no Games has delivered before. "I spent time in the village yesterday talking to athletes that were complimenting us about the Athletes' Village we have presented. "Everywhere we go, the reality of it is people are overwhelmingly very positive about what we are doing." Writing in the Sun newspaper on Friday, London mayor Boris Johnson said people were being gripped by a "paralysing stage fright" ahead of the start of the Games. "We've got an advanced case of Olympo-funk. We agonise about the traffic, when our transport systems are performing well and the world's athletes are arriving on time. "We worry about security, when we always planned to have a strong military role in making our Games as safe as possible," he said. He urged people to "cut out the whining", and to "get behind our team and the Games". The Public and Commercial Services (PCS) union has announced that thousands of Home Office staff will strike for 24 hours next Thursday, when many thousands of visitors are due to arrive in the UK. The action will include the UK Border Agency, Identity and Passport Service and Criminal Records Bureau. The government called the strike "shameful" for threatening to disrupt people travelling to London for the Games, but said contingency plans were in place. East Midlands Trains staff have also voted to strike during the Olympics, from 6-8 August. Mr Farr was interviewed for a BBC Radio 4 documentary, Securing the Games, to be broadcast at 13:30 BST (12:30 GMT) on Sunday.